EN: I can't imagine how I would handle certain moments in my life, whether happy or sad ones without music and I always count on the saying "music heals." My absolute favorite musical instrument is the saxophone, enough for me to hear just one tone and I already have goosebumps all over. I discovered that in Paris we can enjoy "concerts" for free. During warm evenings, nobody wants to sit at home, parks are full of people and everyone wants to absorb as much sun and fantastic atmosphere as possible. 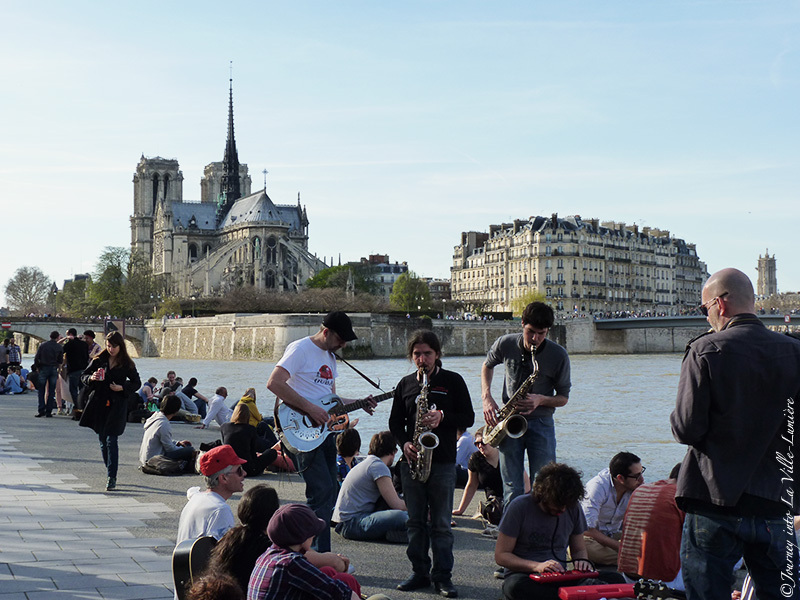 It's not by chance to see a group of people playing guitar or other instruments for pleasure and if you are lucky enough to sit next to them, you can enjoy the music too. There are two events this month that I would certainly not want to miss and one of them is the Paris Jazz Festival, which starts tomorrow at the Parc Floral in Bois de Vincennes until the end of July. Another interesting day is the 21th of June, Day Fête de la musique which is completely free. I really hope the weather will stay nice so we can all enjoy a little bit of music. SK: Neviem si predstavit ako by som zvladla urcite zivotne momenty, ci uz stastne alebo smutne bez hudby a vzdy spolieham na prislovie "hudba lieci." Mojim absolutne najoblubenejsim hudobnym nastrojom je Saxofon, staci mi len jeden ton a uz mam zimomriavky po celom tele. Zistila som, ze v Parizi si mozeme uzit "koncerty" uplne zadarmo. Pocas krasnych teplych vecerov sa nikomu nechce sediet doma, parky su plne ludi a kazdy chce nasat co najviac slnka a fantastickej atmosfery. Nieje nahodou vidiet skupinky ludi ako s radostou hraju na gitare alebo inych najstrojoch pre vlastne potesenie a ak mate to stastie sediet pri nich, tak aj pre vase potesenie. Tento mesiac sa uskutocnia dve podujatia ktore by som si urcite nechcela nechat ujst a jednym z nich je Paris Jazz Festival, ktory odstartuje uz zajtra v Parku Floral in Bois de Vincennes a potrva az do konca jula. Druhy zaujimavy datum je 21 jun, den Fête de la musique ktory je uplne zadarmo. Naozaj dufam, ze pocasie nam bude priat a vsetci sa budeme moct tesit zo skvelej hudby.